The chart for this rug is in Annelle Ferguson's bookTraditional Needlework in Miniature, the chart is based on an antique rug from 1740 and was charted by Sue Bakker from Britain. The real rug was cross stitched and so is mine, I know it doesn't look like a lot but there are already over 4000 stitches in this rug, it will have a total of 76 725 stitches when done and since I only stitch in the evenings this will still take a long time. And for the curious, here is a scan of the real antique that inspired the miniature. I normally don't keep track of the amount of hours that go into a rug, I don't really want to know. But back in 2011 when I wanted to finish a rug in time for Castine, and needed to work out how much I need to stitch each day to get finished in time I did work it out for this rug. More than 400 hours! 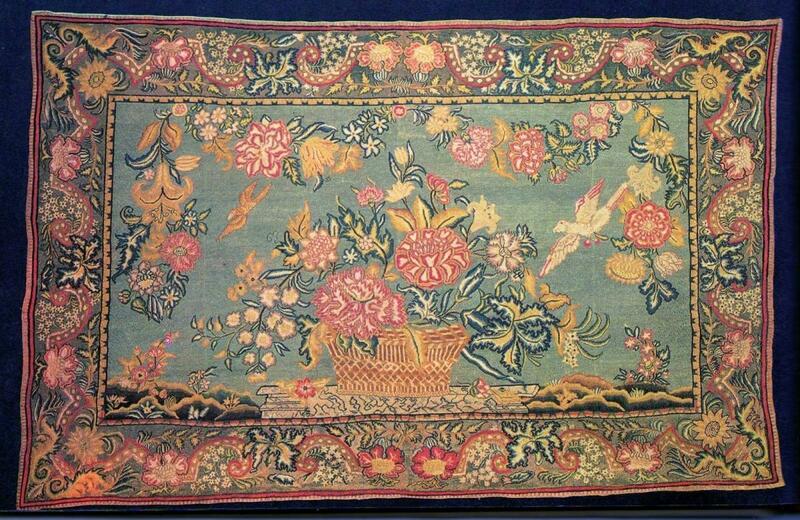 This rug has a total of 53 133 stitches, I used french knots because I like the pile effect that it gives a rug. 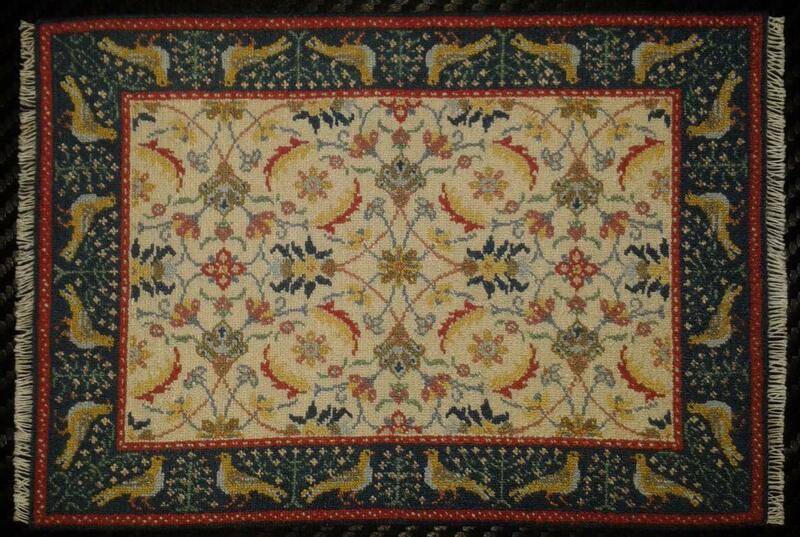 Both of these rugs are stitched on 40 count silk gauze with DMC thread. 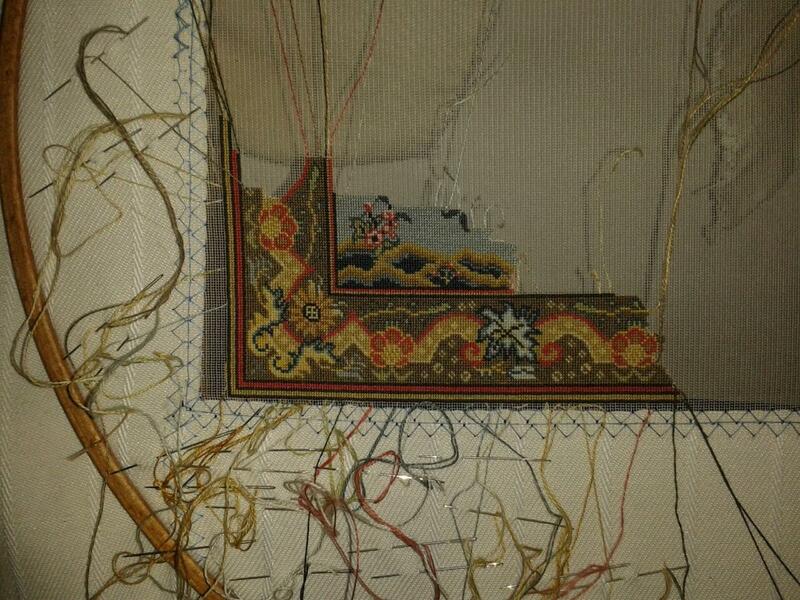 Elga, Your stitching is so beautiful. As good as these photos are, I am sure they cannot begin to do them justice. You must have very good light to be able to stitch at night. I have a Daylight floor stand lamp. It has a big magnifier (I can change the lens strength) It has a circular bulb around the lens. I can take it with me anywhere because I bought the clamp too. I couldn't live without it. I use it constantly. Ooh....so lovely! And thank you so much for showing the rug in process...I hope you will keep us posted as it continues to develop! Catherine, light and magnification...depends on the count I am working on. As I am nearsighted I find the magnification lamp a hindrace in stitching rugs, the focal length are so short that I keep hitting the lamp with my stitching hand which sets everything shuddering, so I use the lamp only for the high counts where the embroidery piece is smaller and the thread lenghts shorter. For the rugs I use a little camping light that goes on your head and +2 reading glasses, still looking to see if I can find a flexable clip-on light to clip on to the hoop frame. Elga, it is so interesting to see how you do your rugs. It is totally different than the way my mother did all those in Twin Manors. She would put in the border, then the center medallion or pattern and finish by doing the background in some sort of a basket weave stitch to keep it square. Your work is wonderful. Thank you for showing it. Elga, where in the world did you find the original rug for the Sue Bakker design? That is a very cool piece of history, but do tell us the details! Did it just pop up in a google search? I cannot believe you are cross stitching this on silk. I really admire that you think 'outside' of the box in your quest for excellence and try different things in our wonderful world of PP. Please note on her third photo, that she used French knots at each intersection of gauze and followed a chart, where most French knot pieces are at the stitcher's discretion of what color goes where...Well Done! I would find following a chart for FKs to be very challenging! fyi, for non stitching people, It takes twice as much time to cross stitch on silk gauze as to do a half-cross... and since it takes a lot of time to stitch a rug, I am always amazed by our stitchers who take the time to accurately re-create their Petit Point treasures! If I am especially diligent in my stitching and using the half cross, I can stitch a 1.25" square in about 10 evenings and some weekend time on 40 count; the higher the count, the slower it is to stich. 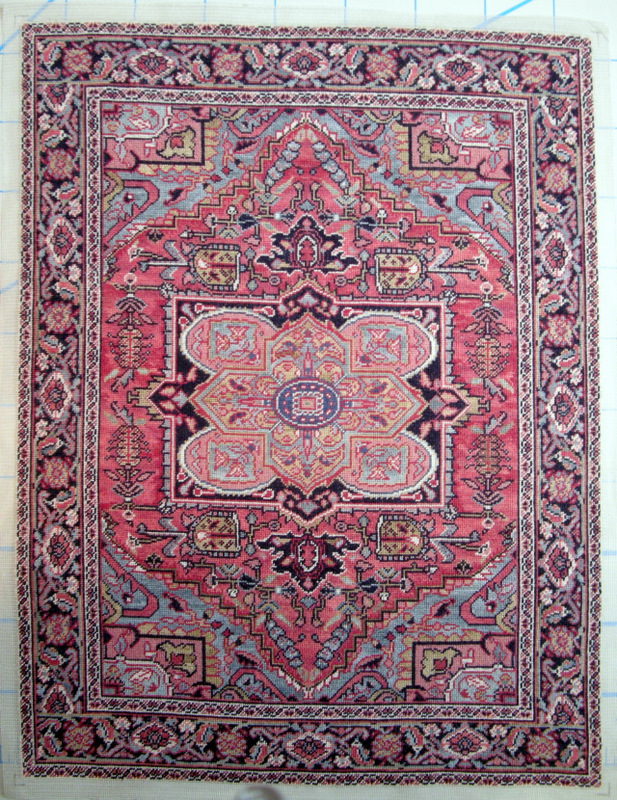 Tamra, in Annelle's book she mentions that there is a photo of the original rug in Lanto Synge's book Antique Needlework, I really wanted to see how the original looked, googled and found the book at a good price and ordered it immediately, the above photo is a scan from the book. I have two of Lanto Synge's book, lots of beautiful pieces in there if you love period embroidery. LOL, I was brand new to petit point when I started the FK rug on silk gauze, the thought that other people would think it strange never occurred to me, when I joined petitpointers there was a FK rug on the home page, I loved the look and decided to do mine like that, I didn't realize at the time that most people stitch theirs on fabric. People who have seen the one on the gauze marvels that it so thin and non stitchers always say it looks just like a real rug, and something I really like too, the rug corners are perfectly square, no distortion which can be a problem with tent stitch. This is so perfect, incredible! And so gorgeous. Wow another 3 years...keep us posted! It is really beautiful Elga. I love the colors and your stitching is perfection. It is a gorgeous pattern. I could never take a project and stretch it out over years. I stitched my Aunt Olga carpet in about six months. That rug is 11" X 8 1/2". I had do do it in tent stitch because I used variegated colored threads to make it look old. I really would have preferred to use the basket weave stitch but that was not an option for that piece. I really miss stitching now that it is finished. I want to do some pillows on 56 count but there isn't a place to buy those threads here. I do not trust choosing colors online. I hope that I can buy them in the spring at the Tom Bishop Show. This is my carpet almost finished. I just needed to stitch the fringe on at this point. Testing to see if I can post a photo. I saw this (incomplete) in person, mind blown! Catherine, my days are just too short, I would love to finish the rug quicker! Which brand of threads did you use for your rug? I have no choice but to order silk online, except for Guterman none of it gets imported to here, I am slowly buying the full range of colors from Pipers Silk in England for all my high count work, with 87 yards on a spool most colors should last a lifetime. With all our postal issues I now need to have it send to a friend and pick it up when I travel. Most of our local companies now use couriers and if you order for about $30 or more they courier it for free. I would love to see your rug, if you do come to Chicago please bring it along...not sure if you know, but the petitpointers usually go to a restaurant on the Saturday night for supper and show and tell. And I am really glad you could post a picture! I am just crazy. I tackle all projects they way I did the carpet. Sometimes I work straight for 14 hours or more at a time. Then I drop and start again the next day. My computer monitor never gets colors right. Every time I order something the color is totally off. I used Gentle Arts Sampler Threads, Simply Shaker. They are over dyed. They go from light to dark and everything in between but not always when you want them to. So... I micro managed that through the entire piece. Sometimes I used a DMC perfect match to get darker in the places I thought needed it. I ran out of the off white Simply Shaker and ended up having to dye a DMC skein to match it. I did that with some transparent inks I have (those I use when furring animals). I was shocked when I finally got a perfect color match and very happy. You know how dye lots vary in some threads. Once you run out, a new dye lot never matches! Yes, I must get some Pipers Silk and whatever size needles I need for 56 count. I have done my share of surface hand embroidery but the Aunt Olga was my first piece of petit point. I will bring it to Chicago. Thank you for asking to see it. Here is a place in Canada that sells them too, maybe someone else will know of a US supplier. John James Needles are very prevalent when I am at the quilting & fabric stores....I think Hobby Lobby & Joann Fabric has the needles in inventory, don't remember seeing them at Michaels... I'm a long sharp needle fan, but my friend Maryse prefers the short needles... so many beautiful options with this line of needles. Size 12 is my go to size for most all hand sewing and petitpoint. I've been making the reservations for our Petitpoint Dinner at Chicago, and will be glad to add you to my list to confirm if you want to join us in 2016. I'm sure the rest of the Petit Pointers would enjoy meeting you in person, and I know we would all love to see the Aunt Olga in person. If anyone else that is reading the forum, enjoys PP and would like to go to dinner with PPs on Saturday night, after the Guild's intro to GS, at the Bishop show, please feel free to contact me. I do need a relative close count for dinner, but the staff has always been accommodating. We have been going to dinner at Harry Carey's Italian Steakhouse for many years, at the Rosemont location. It is an ala carte menu... and you can see the menu on line. Elga, I purchased the overdyed threads for the chart for Elly in Amsterdam... let me know if you want me to purchase them for you if you ever want to stitch it. My brick & mortar store is in the next county, and I pass through when I'm and visiting customers for work. I think it cost about $40 for all the colors that Catherine S had on her chart, but you may want to consider extras as Catherine R cautions. I purchased my threads and chart a long time ago for the Aunt Olga, and they definitely were different then the ones I purchased for Elly. Thank you for the offer of purchasing threads for me, I will keep that in mind. Thank you Elga and Tamra for the information about the needles. I will buy both and see which one works best for me. I hesitate to commit to going to the PP dinner. Only because I usually arrive on Saturday spend the night and leave on Sunday. This year you are tempting me to arrive on Friday and leave on Sunday. :-) Thank you for the invitation. I am sure the reason I ran out of threads is because most Europeans stitch half cross. That was probably how Catherine S. determined the necessary amount needed for the Aunt Olga carpet. I wanted more coverage so I used the tent stitch. Which I believe takes more thread. Elga, I too would always be glad to get you anything you need here in the US. Elga, we will all have a wonderful time at CI 2016... if you are coming here, I can drive you to pick out your own threads - . I like this idea! Have Car & GPS... friends always welcomed... but fair warning I gave an invitation to Hiro this past year for any sight seeing that they want to do in the Chicago area, they haven't contacted me yet, but it is a little early for sight seeing plans. It was a real pain in the tush to drive around this last year, so if you do want to do any sight seeing in Chicago... we can go by car or train... think about it. If you want to go by train, we will take a ride into Chicago on the train so I can practice the foot navigation skills. I was considering taking the train to Chicago for the Guild Study Program, but thought that it may be a little inconvenient for me to not have a car; especially since I am kinda local. Elga, your rug is coming along beautifully. Be sure to bring your stitching to Chicago because we have show and tell during the Petitpointer dinner (after we've ordered but before the food arrives). Tamara does a great job of organizing it for us. Catherine bring your Aunt Olga. It's one design I never tire of seeing. I have the chart so maybe someday... As for your thread bad needle issues, I don't know where you live, but I get silk floss at needlework shops and most of them have the John James needles too. You can get some of the colors of Gutermann at JoAnns and I found some YLI silk thread at a quilt shop. I'm using the YLI for my first attempt at 75 count. Usually I do 40 and 48. She has kindly offered to take me to see the Thorne rooms on Thursday. Since this rug is going to take me a long time to finish and I am hesitant to buy threads until I know what I want to stitch next I probably won't want to buy any threads this time round, I do remember though that you have mentioned fabric stores in Chicago, that might interest me. Traffic, Chicago can't be much worse than here, Johannesburg is listed fifth as the city with the worst drivers, at the moment I take my youngest daughter to work and sit in peak traffic twice a day...the taxi's or mini bus drivers are the worst, they just make their own lanes, when you are in a just turn lane they will come from the lane next to you and just suddenly turn right in front of you, yellow lights mean you can still go and red is just a suggestion that it is maybe a good idea to stop, often three to four cars still go through when it is already green for you...you need hair on your teeth to drive here and eyes in the back of your head. I have patience for busy traffic, but the foolish and dangerous things that people do here that cause accidents makes me just mad. The Thorne Rooms are so lovely... and I get to see them again for the Fall GSP, as long as I can get there on time. Fabric stores are easy - Vogue in Evanston and Fishman's Fabrics in Chicago :-). Lots of fabric silk in both stores.... but I never know what I will find in either store, and you definitely need to buy when you see it in these stores. I have been shopping in these two stores about 2x per year for several years, I know that the silk inventory definitely changes. Entire hides of cow leather is very inexpensive at Fishman's fabric - which is great for reupholstering a full size piece... but goat skin leather that we generally use for miniatures is less expensive in NYC Garment's district. Fishman has a wonderful inventory of fine wool for clothing too... I've looked for a soft colored, very fine ivory for crewel work, but just haven't found the right piece, but both of these stores are wonderful to shop. Johannesburg sounds like my driving experience in Boston this past summer. Boston is the worst city that I have ever driven in. I wanted to call the mayor and the Boston Globe. Catherine, it is really fun to go to dinner with PPs, and seeing so many wonderful projects finished and / or in process...I do hope you will join us! Tamra, when will you be going to Vogue and could I tag along? I have some Gutermann and might like to have more. I love looking at silk fabrics too.